It’s now over two and half years since I started blogging. Do you know what? It’s been the best time ever. I’ve found something I know I was destined to do. It’s the right time to start sharing my knowledge. I knew nothing about blogging at the start and learnt so much as I went along. In fact I’m finding that there is always more learning to do when it comes to blogging. There are many tips to share and these will come, but first I want to tell you my 5 Top Tips for Newbie Bloggers. You have already made the first leap, by deciding to blog. Now write, write and write. At first like most newbie bloggers you will be writing for yourself. In fact I’m sure even now some posts I write only a small handful read them. But do you know what? That doesn’t matter. Your writing will be getting better and you will be finding your own voice. There is a saying in the blogging world that “Content is King” so write unique content to you and don’t copy. Interact with other bloggers within your niche. RT or share one of their posts. Comment on bloggers posts. I try to do at least 3 a day. When I first started blogging I would join in with lots of ‘linkies’ and comment and share their posts. If you are not sure what a linky is Cuddle Fairy has a guide for newbies. Plus You Baby Me Mummy has the best Linky List for bloggers. Oh and make you reply to comments left on your posts, it’s not only a polite thing to do but is great for building conversations and ultimately your community around your blog. To start building your blog’s exposure and to gain backlinks which will increase your ranking, write for other blogs and publications. Increasing your blog authority will help you to rank higher in search engines. I love guest posting, sharing my stories on other blogs. I aim to guest post once a month. In fact if you want to guest post right here on my blog I run a New Mum Stories Series which is an ongoing thing where mum’s share their stories on becoming parents for the first time. You want your blog to be reader friendly. An easy to navigate blog will keep readers for longer. Have visible sharing buttons and follow buttons so readers can share your work and keep up by following you. Easy to comment boxes. I myself cannot stand adverts popping up here there and everywhere, it’s annoying to read the post. So place adverts carefully if you need to. As a newbie blogger have you thought about where you want your blog to go? Are you happy just writing for you? Or do you want to turn your blog into your business? I’m the latter. To build your brand you need a plan of where you want to go. You could very well need your own logo so you can be recognised. Very recently I had a play around with designing a new logo from Logojoy It’s a fun and easy website to use. All you have to do is pop in your blog name and slogan, then it will take you on various steps for what type of designs you prefer. Your brand colours. The type of fonts and symbols you want, before finally showing lots of different logos incorporating your details and you can pick and choose the one for you. I have enjoyed using their website that much that I’ve decided to become an affiliate for them and will continue to recommend them for logos for everyone! You can use my affiliate link here: Logojoy if you wish to have a go at designing your logo. The site lets you design your logo for free and only charges you when you wish to purchase your final product. 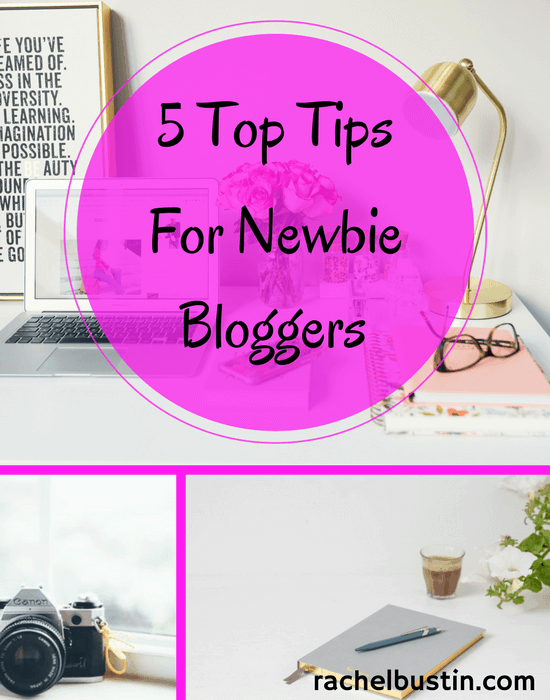 Well these are my 5 Top Tips for Newbie Bloggers, do you have any tips that you have learnt or are learning? *I was invited to try out the Logojoy software, however all thoughts and opinions are my own.